Fun art for gifts every day! Many customers have concerns about complex caricatures that often include a lot of people. Others have a specific goal in mind. It can be quite stressful for the customer, as they have some vision in their mind of how it will be. 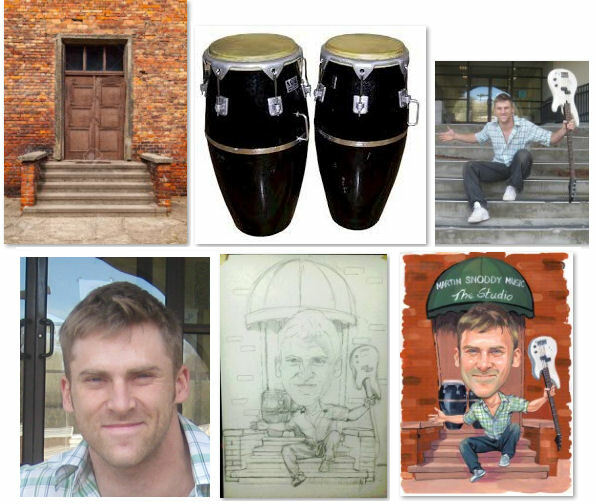 The case with this caricature the customer thought through and even did a sample pose and supplied a pic of the doorway! Often all John needs is aa word picture or even a very simple sketch that clearly showed where people were to go, a clear description and images of the people and main components it makes John’s job easier to then draw up the base sketch for approval before final coloring. This job was great fun because the customer was able to supply images a showing clear pose! The picture shows the custom caricature gift creation process. Of course you do not need to do this but it can help on jobs which you want exact pose/positions. The customer and I were very happy with the outcome! Want a caricature for a special occasion? Browse more samples on the main site.